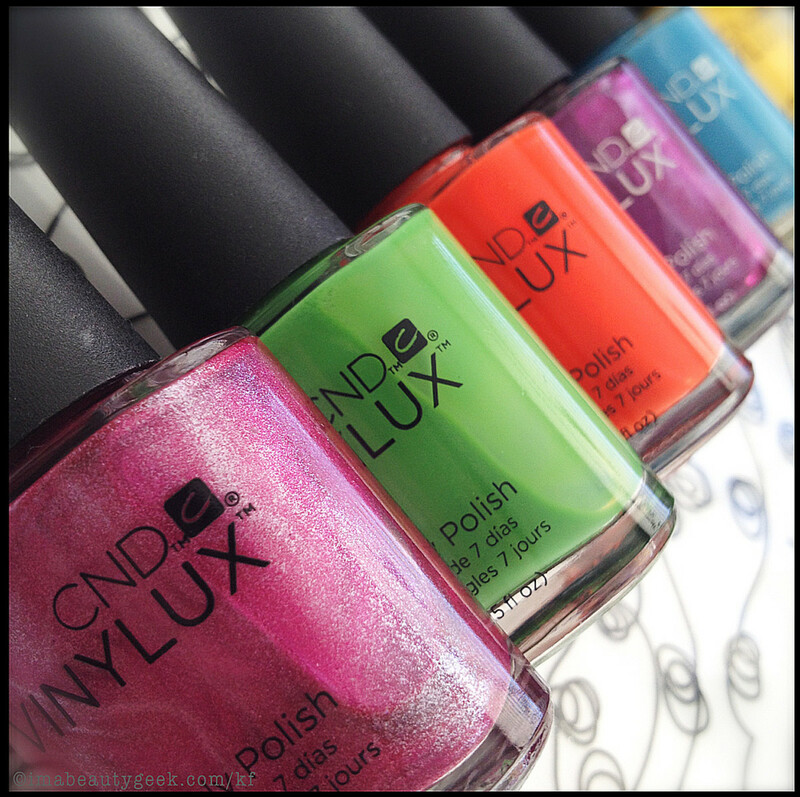 The CND Vinylux Summer 2014 Paradise Collection has launched! Wanna see? The CND Summer 2014 Paradise collection came through my door a couple weeks ago and it&apos;s been on my mind ever since. When new stuff shows up, sometimes I’m chuffed to get to work. And sometimes I’m really not. This CND Summer 2014 lineup was a whole ’nuther story. I haven’t been as excited about a whole collection in a long, long time. The shades are all kinds of summer. Had it been up to me, I might have forgone one of the metallic purples in favour of a good solid shade of hot pink but on the whole, this CND Vinylux Summer 2014 collection of colours is more cohesive than most. 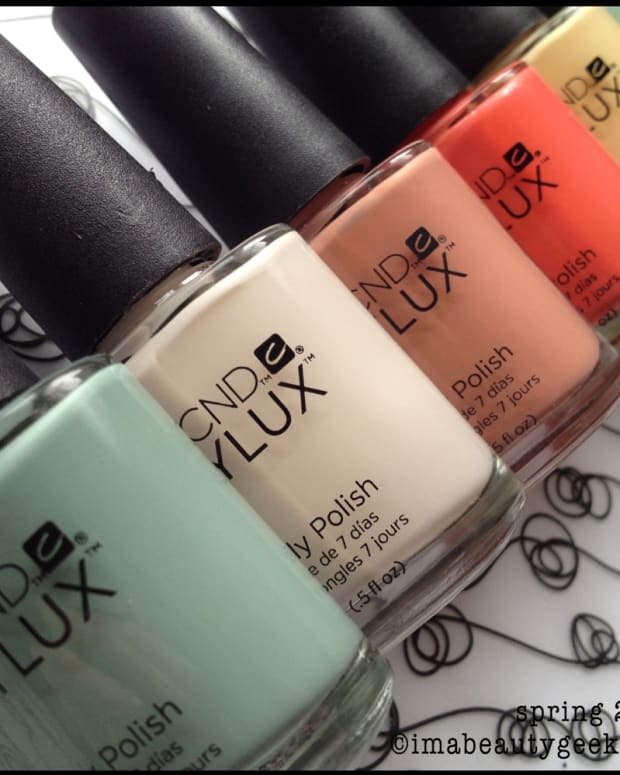 Application in regards to the CND Vinylux Summer 2014 Paradise collection is mixed. The brushes don’t spread as much as I’d like them to and the self-level on Bicycle Yellow and Lush Tropics could have been better (both of those needed three coats to get what I&apos;ve shown you). Dry time for me on all of them was not eight minutes -- more like 15 -- and the lack of flexibility of the Sultry Sunset brush resulted in a streaky frost application. Aggravating. But, look at these colours! I’m a sucker for uncomplicated shades of polish. I like solids. I like highly pigmented shades. I like polish that can be seen and also heard. The CND Vinylux Summer 2014 Paradise collection certainly fits the bill. 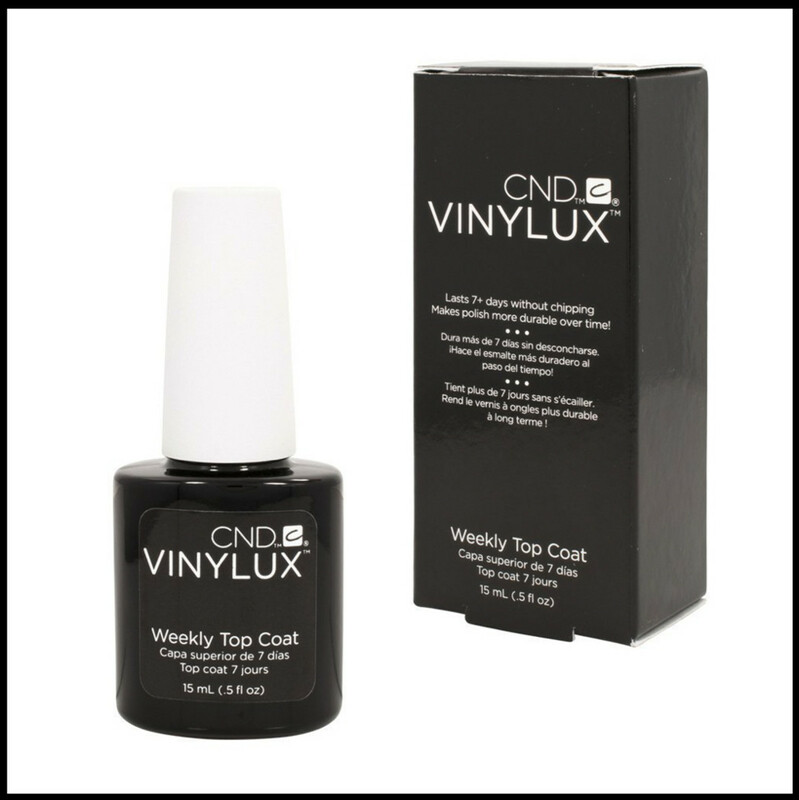 For those of you who are lucky, this CND stuff will actually be a weekly polish (and you must use the CND Vinylux Weekly Polish Color Coat with the Weekly Polish shades). For those of you who are like me and who stick your hands into all kinds of damaging chemicals and scrape them up against things all day long, you might not be so lucky. 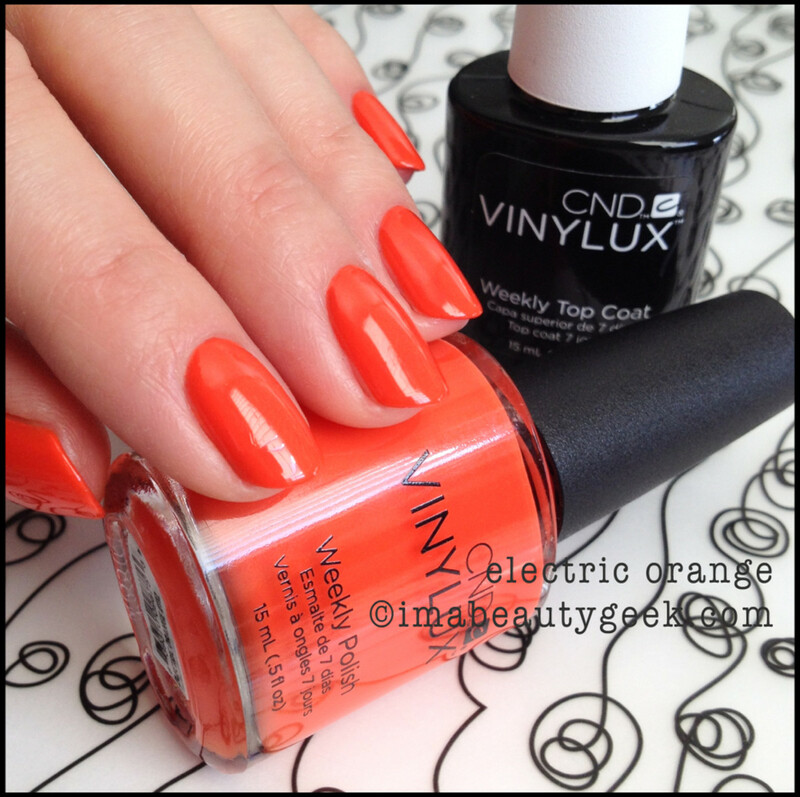 I tend to look at Vinylux as a regular polish – I wear it for the shade. Others wear it for the long-lasting-ness. 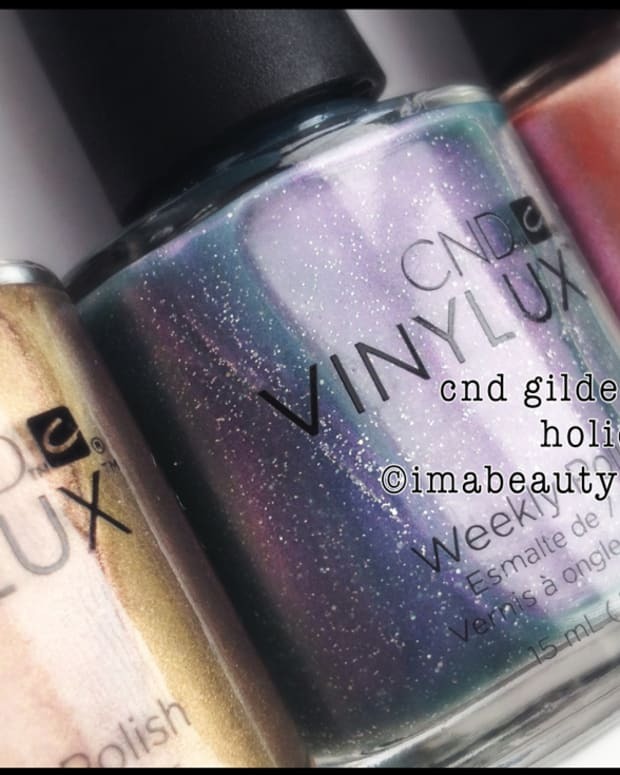 Either way, you should wear at least something from the CND Vinylux Summer 2014 lineup just because it’s perfect for the season. Happy and bright, this six-shade CND Vinylux Summer 2014 Paradise collection is available at NailPolishCanada.com and other select retailers in CND Shellac 14+ day wear formula ($19.95 per shade - professional salon application advised) and also as the CND Vinylux Weekly Polish System ($11.95 per shade) as of March 1, 2014. Manicures and photos by Karen Falcon (where are all my hair ties?) ©2014 BEAUTYGEEKS/imabeautygeek.com. CND Weekly Top Coat image via amazon.com.